I’ve recently updated my live looping setup. The biggest improvement is made by using the looper instrument in live8. This finally allows me to create loops around my patterns, rather than having to fit my patterns around a prefixed tempo. My system uses a few puredata patches to manage the user interface. 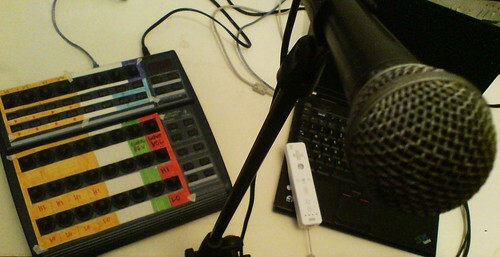 The wiimote and the bcr2000 handle all control and feedback requirements via puredata. If you’re interested, here is an archive of all the config files. ← Previous Previous post: video editor wanted! Next → Next post: video editor found! I’m doing live looping with roland Sp555 but I haven’t Live 8 but I’m starting with Pure Data. Send me an email and let’s have a talk!